LG has sent out invites to its MWC 2017 press event and it will take place on the 26th of February at the Sant Jordi Club in Barcelona, the company will announce their new LG G6 smartphone. 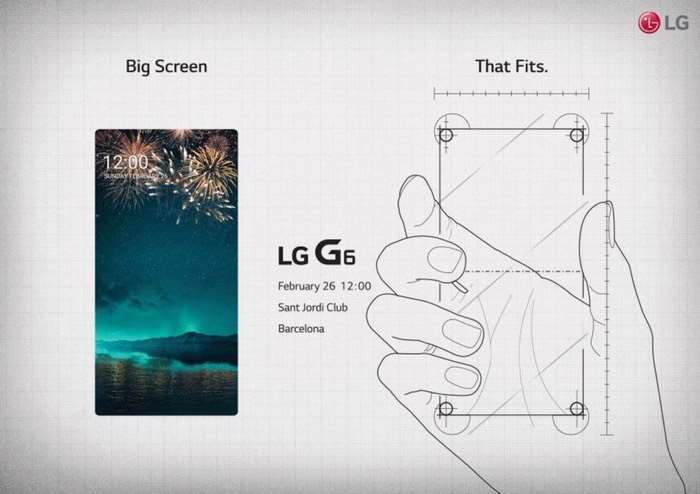 As we can see from the invite above, LG are teasing the new handset with the tag line ‘Big Screen That Fits’, We know that the display on the new LG G6 will measure 5.7 inches. LG previously made their new display for the G6 official, the display with have an aspect ratio of 18:9 and it will come with a massive resolution of 2880 x 1440 pixels which is higher than QHD, it will also feature 564 pixels per inch. Rumors have suggested that the new G6 will be powered by a Qualcomm Snapdragon 821 processor and that the device will come with 4GB of RAM, this has yet to be confirmed. What we do know is that the LG G6 will feature dual cameras on the back with an LED flash in between them, under this there will be a fingerprint sensor and the device is expected to come with Android Nougat.